Among the priorities of clients when making product inquiries is the price of each item. Along with that is the sending of an official quotation which is prepared and done by the seller. 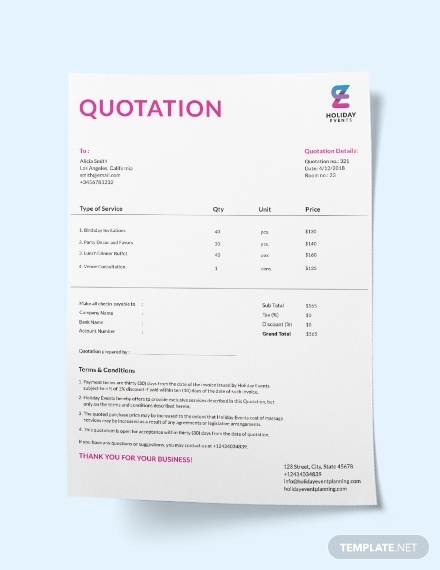 Aside from the product list or scope and pricing, quotations also provide other necessary details useful to the client and also necessary for you since whatever you put in your quotation can make or break your chances of getting a deal. 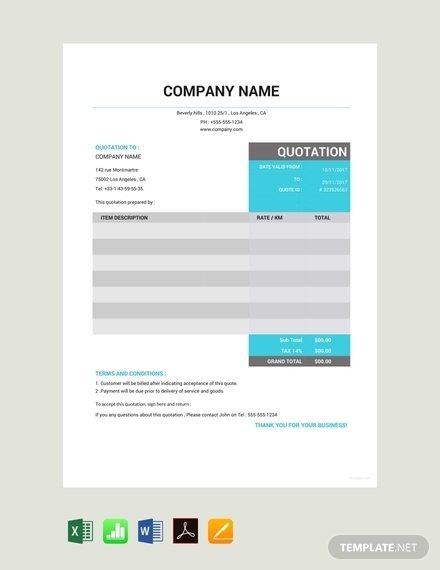 In this article, we will help you create a quotation for your company using quotation templates. 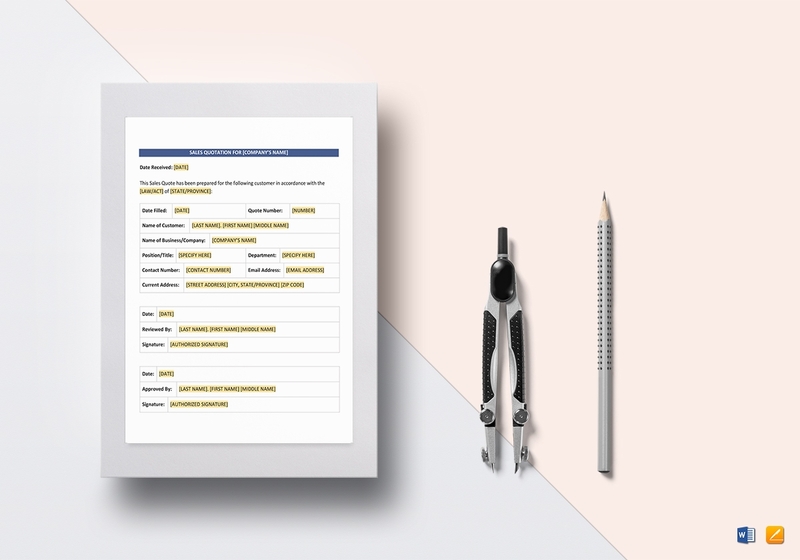 These templates are easy to download and edit using Apple Pages. Along with that are discussions about the must-have contents of a basic quotation and guidelines on how you create one. 1. 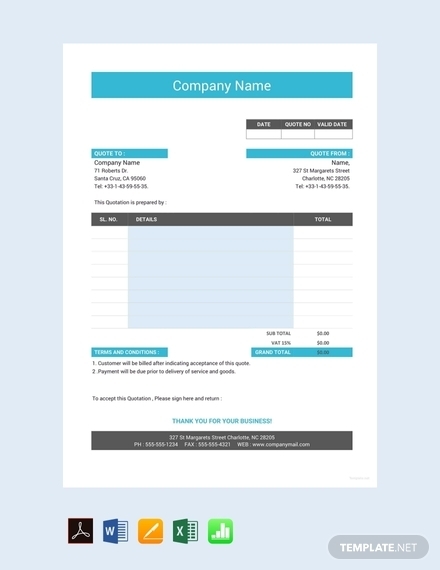 Company information: This includes your company logo, company name, company address, contact numbers, and email address. This boosts your branding and provides your clients with a way to reach and communicate with you. 2. 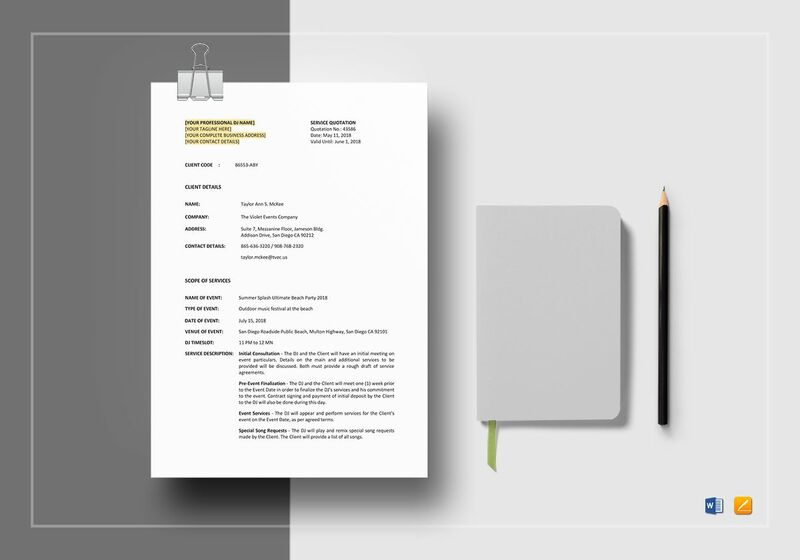 Salesperson information: This includes the name and contact details of the salesperson in charge of the transaction whom the potential client can contact or refer to in the event that he or she will have further inquiries and other clarifications. 3. Validity date of the quote: The costs of raw materials needed in the production of goods or products are constantly changing and this is why the validity date of the quote must always be indicated to keep it accurate. The usual validity period of most price quotations is only for 30 days. 4. 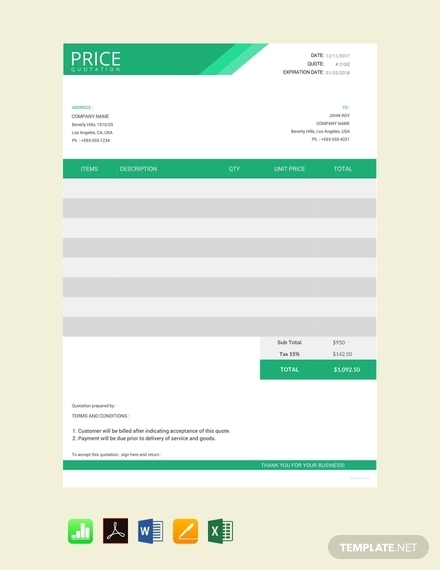 Product details: This includes specific details such as the color, size, variations, and the quantity of the goods and products requested by a client. These details must be clearly specified. 5. 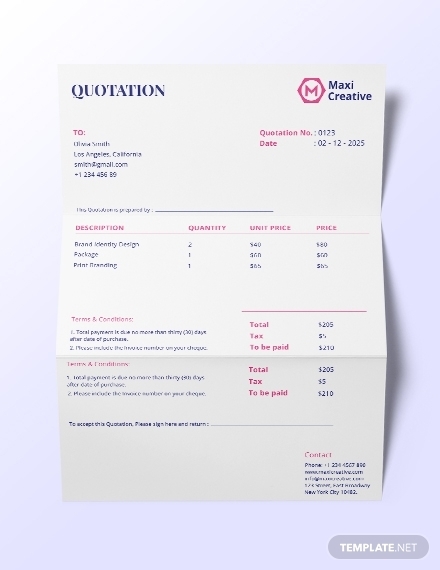 Price per quantity: A quotation must also indicate the price per item. Aside from that, you can also indicate certain discounts that you can offer to your clients especially if they buy in bulk. This encourages your potential clients to buy in large quantities. 6. 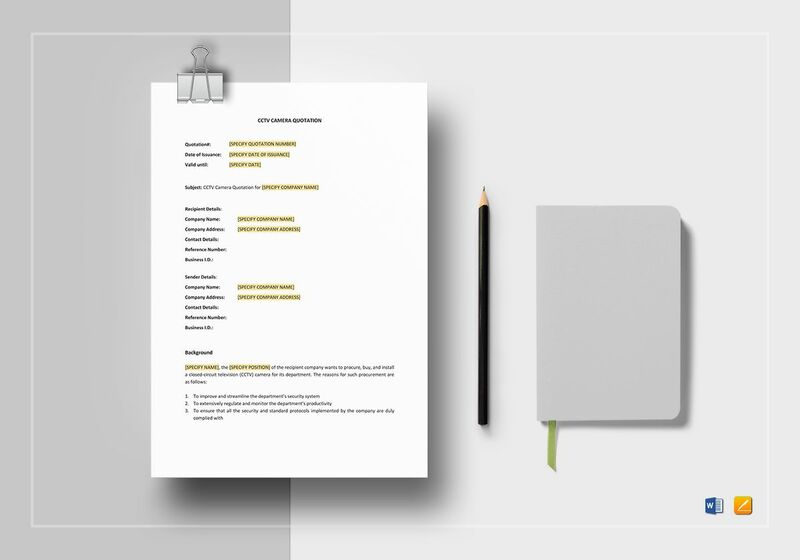 Additional charges: Your potential client has the right to know the additional charges added to the total price of the goods or products alone. The possible additional charges include transaction fees, shipping fees, and taxes. 7. Grand total: To get the grand total, you have to add up the subtotal, or the total price of the products and goods alone, and the additional charges. 8. Terms and conditions: A quotation must contain at least a brief statement of the terms and conditions of the quotation you just made. 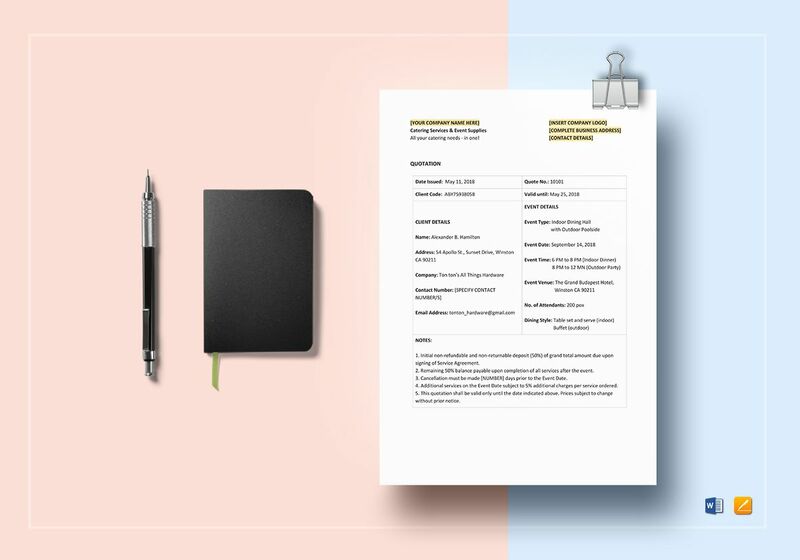 This is where you can also add a note for your client as well as the limitations and terms of sale of the good or products he or she requested. 1. 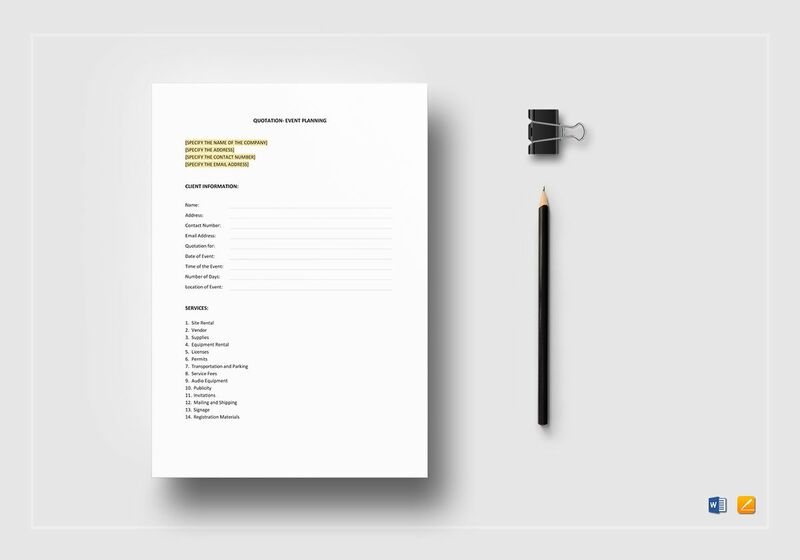 Decide on a template: Since you are going to create a quotation using a template, you obviously have to start by choosing your preferred templates. 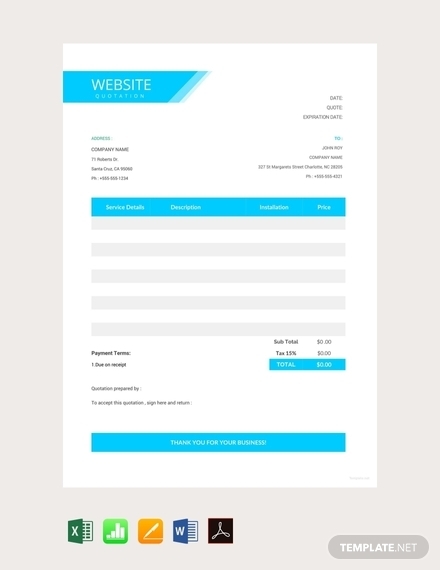 You can find a lot of these in the Internet and we have even provided you with a wide selection of quotation templates in this article. 2. 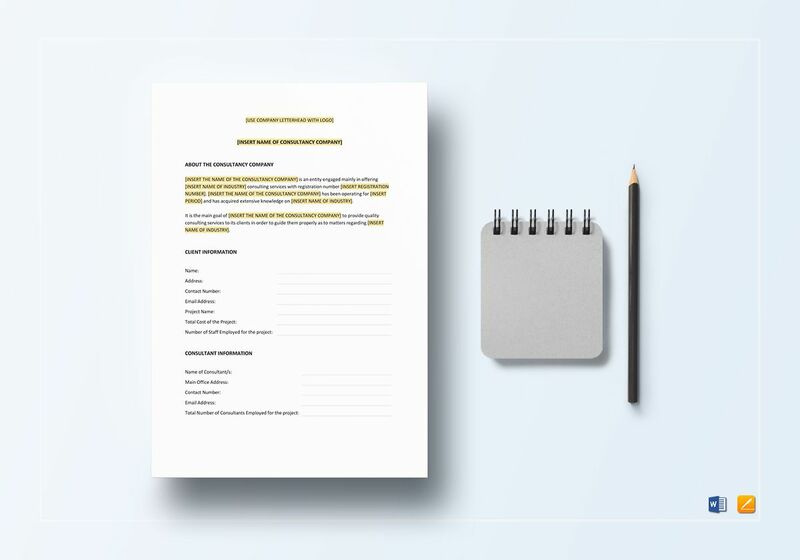 Carefully assess your client’s order: As soon as you have decided on a template to use, it is then the time for you to assess the request or the order made your client. This includes the goods or products he or she wants to purchase, the quantity for each good or product, and its specific descriptions. 3. 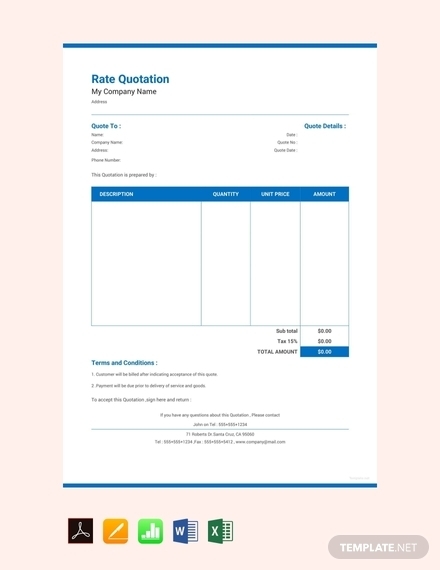 Input the details: After evaluating your client’s order, you can now place those details in the quotation template you have chosen. It is also in this step where you will place all of your company’s branding elements. Make sure that you will not miss anything or make any errors in providing the details. 4. 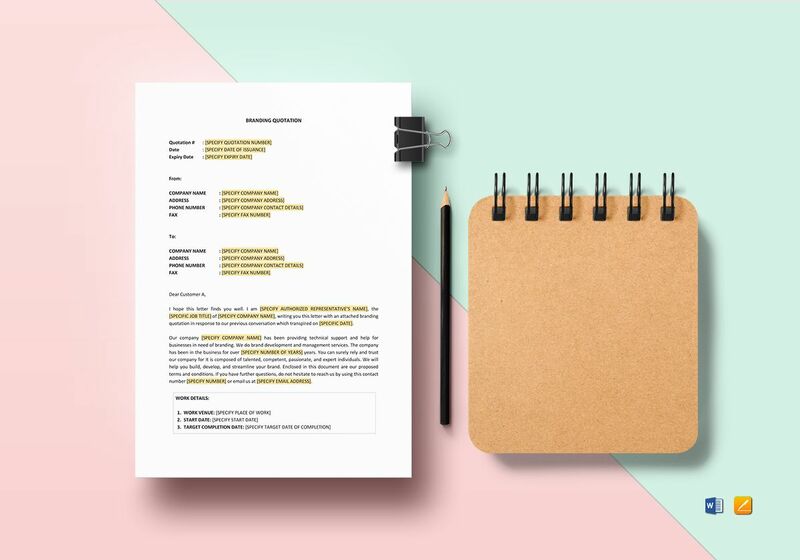 Edit and Finalize: Before you send the quotation to your client, check first whether the quotation you just made contains all the necessary elements and all the important details that it should contain. 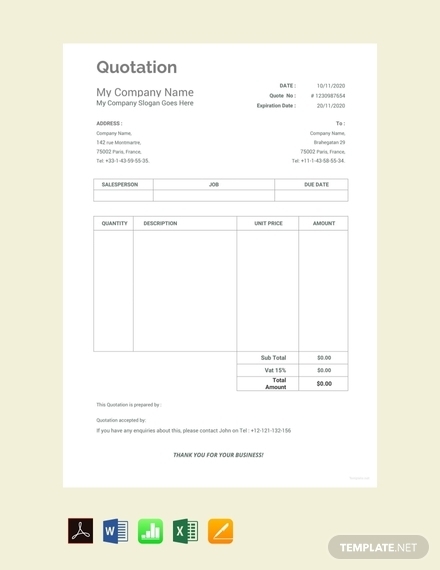 Aside from that, do not also forget to customize the overall quotation template design so you can call it your own. Here are the answers to some of the frequently asked questions regarding quotations. When should you send a quotation? 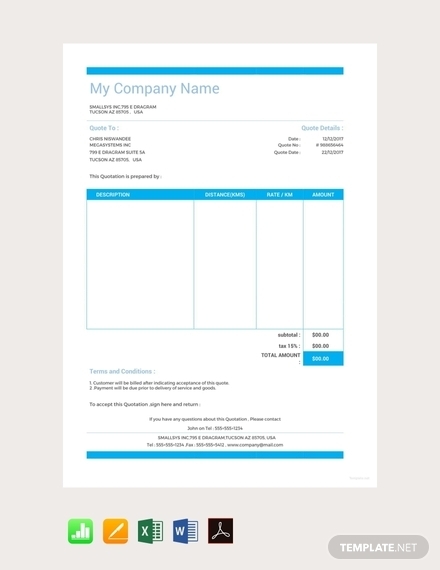 You must send a quotation before you send the invoice. A quotation is not a form of a payment demand because it simply presents the client the information regarding the goods or products that your company offers. 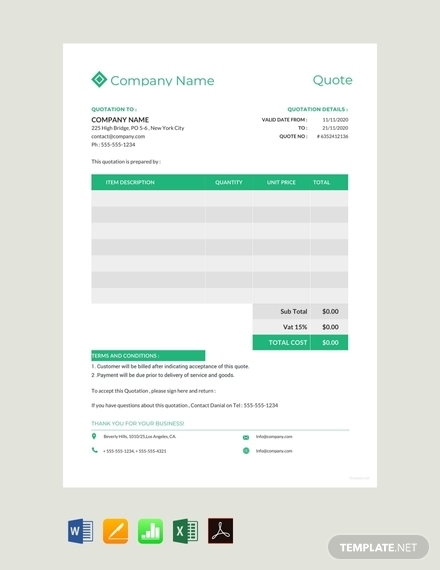 What is the difference between a quotation and an invoice? The main purpose of a quotation is to simply inform a potential buyer regarding the price and the quantity of the goods or products he or she requested and inquired about. 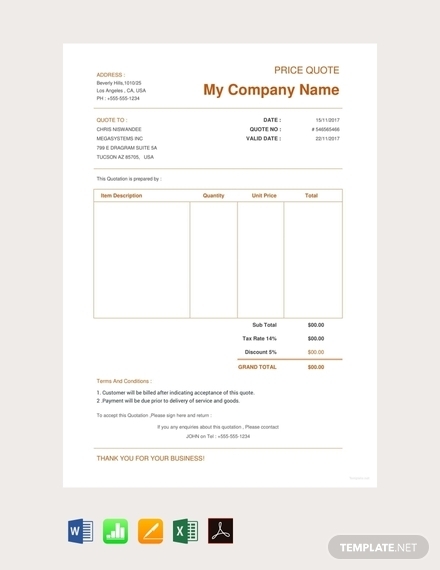 The price and quantity indicated in a quotation are still subject to change. On the other hand, the main purpose of an invoice is to inform the buyer the fixed and final total amount that he or she has to pay. We hope that you will be able to create your own quotation with the help of this article. 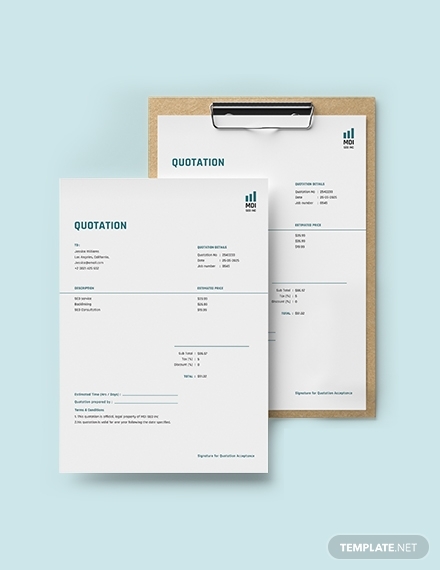 Be sure to also check out and make use of the quotation examples and templates that we have included.